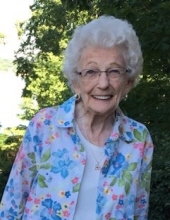 Age 90, a native of Mars Hill, NC has passed peacefully on Jan 15, 2019. She obtained a BS from Appalachian State and post graduate work at Clemson University. Married for 58y to LTC (ret) James D. 'Doug' Marett. During the 21 years in the military, while traveling both the US and overseas, Jane used her education to teach, become a school principal and support her family. After the military they returned to SC as administrators of Tamassee DAR School (1974-1982) providing a home and stable environment for over 200 children. Eventually retiring in Anderson, SC. There Jane worked at Belks store and volunteered regularly at the Anderson Medical Center. She was a member of the Ladies Auxiliary American Legion and a lifelong member of the Military Officers Association. Jane was a devoted Clemson fan (both husband and eldest son graduated there) with IPTAY membership. She and Doug attended all or most home games and away games for close to 40y and injecting that orange blood into all her offspring. After her husband's death in 2008, she moved to Brighton, MI with daughter, Melanie and family for the past 9 years. Always there for her family, she traveled often to visit and attended many of their events. Many in Brighton became fond of Jane, calling her 'so adorable' and 'so cute', with her wit and joy of life. She is survived by - children Melanie (Steve) Cupples, Charles Daniel (Marty) Marett, daughter-in-law Olga Ganichev Marett, 15 grandchildren and 19 great grandchildren; - siblings Catherine Ray Fleming and COL (ret) Robert Garrett (Betsy) Ray. Jane is preceded in death by husband Doug, son LTC James D. 'Jim' Marett, and daughter Susan Elise Marett, siblings Avon O. Ray 'Junior', Charles Dalton Ray, Ethel Ray Cox and Jean Ray. Services are to be held on Saturday, Jan. 26th at the Sullivan-King Mortuary chapel, Anderson, SC from 2pm – 3pm with a 'Tailgate' celebration of her life afterward (destination to be provided). The burial ceremony will occur the following morning Sunday 27th at the Old Stone Church cemetery in Clemson with family. Checks can be made out specifically to St. Joe's Brighton Cancer Center, or even SJMB Cancer Center. It is recommended that IMO Jane Marett be written in the memo line, or at least included in a note accompanying the check. Using the Designation drop-down field, you will see two options for supporting the St. Joe's Brighton Cancer Center. "Email Address" would like to share the life celebration of Jane R. Marett. Click on the "link" to go to share a favorite memory or leave a condolence message for the family.